This is a personal self-help book written by someone who has both succeeded and failed in life, and come to recognise the value of treating life's inevitable adversities as the teaching tools that they are. This is Al Weatherhead's The Power of Adversity, and it reveals how Al battled parental 'rejection', bouts of severe ill health, two failed marriages, business setbacks and still became a successful businessman, philanthropist and husband! Whilst I did not find The Power of Adversity to be life-transforming like some of the other books I review, I found it to be an engaging read nevertheless, and it confirmed many of the things I now believe (in self-help) about living my best life. So I can highly recommend this book. What I particularly enjoyed about The Power of Adversity, was the fact that much of this book is about the author Al Weatherhead's story - his triumphs, yes, but also his failures, some of them quite personal. There is humour, self-effacement, and brutal honesty. Al understands that you can't do this all by yourself - sometimes, especially when times are hard, it's okay to reach out and ask for help. This is one of adversity's many lessons to us, should we but notice. Also, Al realises that life is always a work in progress, and that his life, like yours and mine, will always be filled with adversities - some of which we may find hard to bear. Still, Al believes in the power of adversity to make you stronger. And, now, so do I. 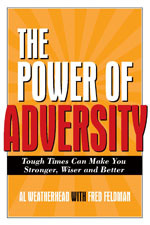 What do you think about The Power of Adversity - do let me know! Please comment below.